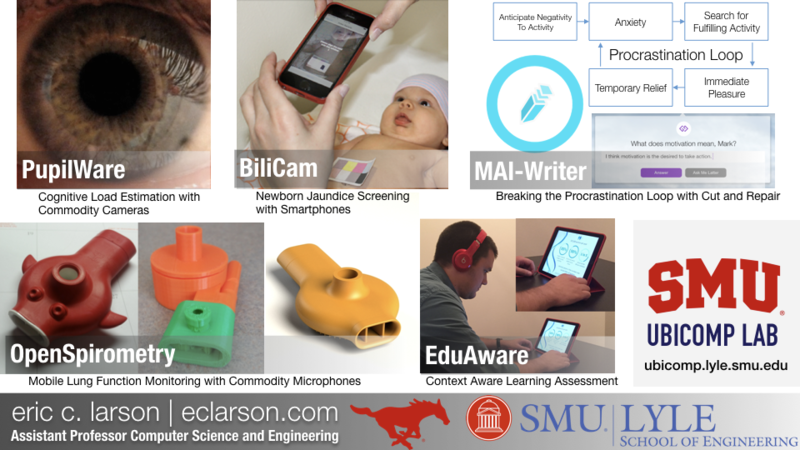 The SMU Ubiquitous Computing Lab is at the intersection of computer science, cognitive science, design, and the health sciences. It focuses on the design, development, and evaluation of interactive, pervasive sensing technology to support health and healthcare. We work on projects targeting mobile health, medical informatics, and ubiquitous computing. To do this, we combine techniques from human-computer interaction (HCI), machine learning, embedded systems, signal processing, networking, and electrical engineering. For thirty years most interface design, and most computer design, has been headed down the path of the “dramatic” machine. Its highest ideal is to make a computer so exciting, so wonderful, so interesting, that we never want to be without it. A less-traveled path I call the “invisible”; its highest ideal is to make a computer so imbedded, so fitting, so natural, that we use it without even thinking about it. (I have also called this notion “Ubiquitous Computing”, and have placed its origins in post-modernism.) I believe that in the next twenty years the second path will come to dominate. But this will not be easy; very little of our current systems infrastructure will survive.